Glycolysis and hemolysis: Does it still matter to life insurers? We all know the routine. The examiner draws blood during a mobile exam. Delays in processing allow those hungry red blood cells to gobble up glucose. The underwriter sees an extremely low glucose reading or the dreaded not valid glucose (NVG) on the laboratory report. Or the laboratory report notes hemolysis is present. Then there are the results of a CBC where the blood was collected Friday afternoon, but not analyzed until Monday morning. Now what? Does any of this matter to the underwriter? We used to think glycolysis was a seasonal issue. While it is more severe during the warm summer months, ExamOne data shows this issue is present throughout the year. But the question is: does very low glucose or not valid glucose still matter to life insurers? With the majority of insurers now routinely testing A1c on every blood specimen, concerns with glycolysis are almost eliminated. A1c measures average blood glucose level for the preceding two to three months and is unaffected by glycolysis. Thus, it is a superior underwriting tool for measuring glucose control and is the recommended testing protocol for diagnosing diabetes by the American Diabetes Association. Companies foregoing A1c testing must order a blood collection recheck or roll the dice and hope the applicant does not have a risk of glucose intolerance or diabetes. Hemolysis is the breakdown or rupturing of red blood cells. 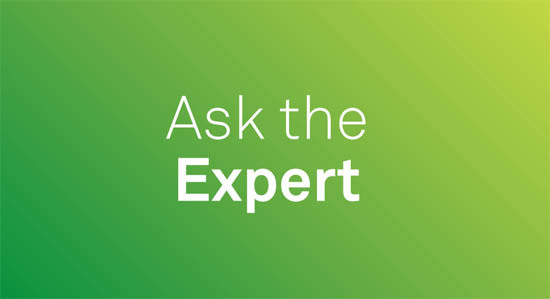 Hemolysis has a minor effect on a few blood analytes—particularly the aspartate aminotransferase (AST)—and is generally of minimal concern to the underwriter. Underwriters can feel comfortable underwriting specimens reported as having slight hemolysis. Severe hemolysis, however, may have a significant effect on the AST, alanine transaminase (ALT), alkaline phosphatase (ALP), bilirubin, protein, triglyceride and glucose. If the hemolysis is too severe, the laboratory may result those analytes as “not valid – hemolysis” (NVH). Basing underwriting decisions on severely hemolyzed specimens can be risky. CBC results are fairly stable for approximately 72 hours at room temperature. Refrigerated specimens are stable even longer—for another two days. Delays in processing yield questionably accurate results, especially when evaluating anemic applicants. According to ExamOne data, 15 percent of specimens are impacted by glycolysis and 4 percent are impacted by hemolysis. Advancements in testing protocol and availability of clinical exam centers have helped reduce the prevalence of specimen degradation. A1c is stable for the life of the purple top tube—28 days—and it is unaffected by pre-analytic conditions such as heat and time, eliminating the risk of glycolysis. ExamOne’s routine risk assessment screen includes A1c testing so every specimen is tested upon arrival at the laboratory. In addition to being a convenient option for applicants, exam centers provide a level of confidence unmatched in the life insurance industry. 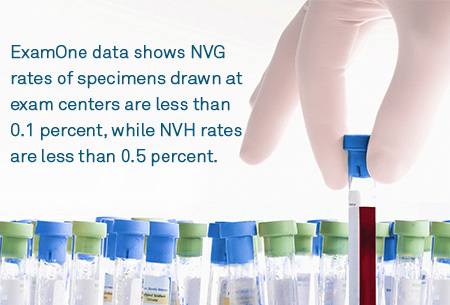 ExamOne data shows NVG rates of specimens drawn at exam centers are less than 0.1 percent, while NVH rates are less than 0.5 percent. 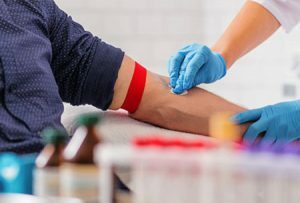 Blood collected at an ExamOne or Quest Diagnostics exam center is processed and analyzed within 48 hours so the chances of specimen degradation due to temperature or processing delays are significantly reduced, giving insurers confidence they are basing underwriting decisions on accurate health insights. How much does life insurance cost a Millennial?